Yu. Yu. Klever is one of the most prominent representatives of Russian landscape painters. A painter of German origin, he always dreamed of returning to his native land. 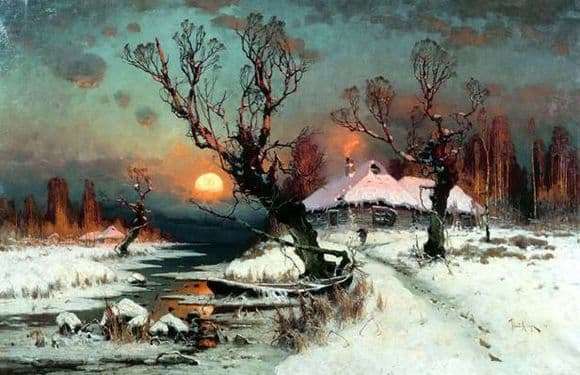 The painting “Sunset in Winter” reflects the beauty of nature. The image looks a bit cosmic, almost completely solar disk is visible, and the clouds around it give mysteriousness and shade a fiery glowing ball. The last sun rays are reflected in the quiet water surface. The river goes to infinity, and the road from the reflections of sunshine leads the beholder into the depths of the cosmic universe. The water surface passes through the forest edge. You might think that this is the outskirts and people rarely visit such places. A lean wooden house stands alone, squinting at the severity of the snow. At first glance, this dwelling seems abandoned and for many years lonely continues to stand near the coast, meeting its sunset. From the pipe you can see a subtle streaming smoke. So, yet no one left the house and life goes on in it. From the picture breathes a little loneliness. Perhaps it was during this period of creativity that Clover felt like a recluse, lost in life, like this house by the river. He also stands at a loss and watches the sunset, which symbolizes the end of a certain life stage. During the creation of the work the artist lived abroad and suffered a lot about it. The picture conveys the atmosphere of a winter evening, nature seemed to fall asleep. Two trees in the foreground seemed to freeze before crossing the river. They doubt their decision, but do not rush to make a choice. It remains a mystery what exactly Y. Klevera worried about. He was hesitant in making a decision, or, like a small house, he stood and watched the sunset watch the sunset. And everything is beautiful around, a magnificent landscape, an endless river, but the sunset brings on sadness. That sadness froze in the beautiful reflections on the riverbed, underlined by a flock of clouds.